Apple supplies documentation sets that let you read Mac OS X, iPhone, and developer tools documentation in Xcode. But you are not limited to reading Apple’s documentation in Xcode. 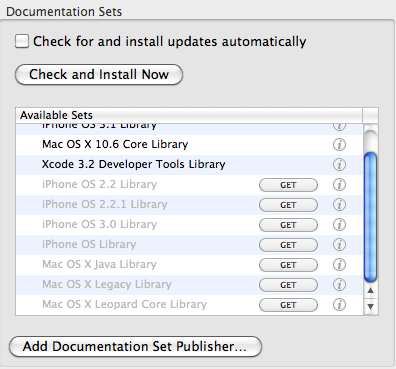 This post shows you how to install and read third-party documentation in Xcode. Open Xcode’s preferences by choosing Xcode > Preferences. Click the Documentation button in the Xcode toolbar window. The Documentation button is on the far right. You’ll have to use the scroll bar to get to it unless you have a very wide monitor. You should see the documentation sets on the left side of the documentation preferences. Click the Add Documentation Set Publisher button. You will be asked for a feed URL. RSS feeds start with feed:// while Atom feeds start with http://. Click the OK button when you’ve finished entering the feed URL. After adding your documentation feed, it should appear in the list of available sets. Click the Get button to install the documentation in Xcode. After installing the documentation, open Xcode’s documentation window by choosing Help > Developer Documentation. Click the Home button in the documentation window toolbar. A menu with a list of installed documentation sets opens. The documentation set you installed should be one of the menu choices. Choose it to read the documentation. To remove documentation you installed, open Xcode’s documentation preferences. Select the documentation set from the list of available sets. Right-click and choose Reveal In Finder. Drag the documentation set to the Trash.